This week has been a bit light on blogging and gardening as I am busy marking exam papers. Luckily Arty is happy to help. 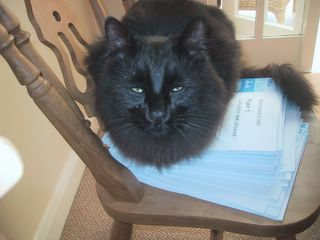 Here he is guarding the papers! Is Arty giving them good grades? He looks very fierce in this picture. Good guard cat! Ooh, I have been helping my mum to mark test papers too! I will have to put a photo of myself helping on my blog. Arty and I are both helpful marking cats! At least Arty has a sense of professionalism. When I got my teaching license I made the mistake of leaving it on a chair. It got knocked off by I wonder who and then the worst happened. One of the cats peed on it. Big stain. You can't tell me they can't read. They like me being home and let me know all the time. A different sort of Saturday. Velvet and Arty enjoy the sunshine.